Wind will affect the shot's path. Controls Shoot: Slide ↓ on the Touch Screen and release. Aim: Slide ←/→ while holding down the stylus. Archery (Individual) is a Shooting Event that appears in the Nintendo 3DS version of Mario & Sonic at the London 2012 Olympic Games. The aim of the event is to score the most points over five rounds by shooting the targets. The starting record for this event is 45pt(s). 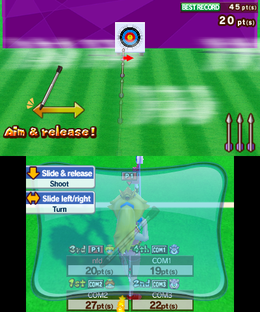 In the game's story mode, Archery (Individual) appears as the second and part of the fourth challenges of Girls Episode 2, Peach in a Pinch, in which Peach must beat three Fog Impostors of Blaze as the second challenge and Blaze must beat three Fog Impostors of herself as well as in Balance Beam and Keirin as the fourth. It also appears as part of the challenge of Girls Bonus 1, An Innocent Request, in which Amy must beat Blaze in the event, alongside Keirin and Omnium. It appears again as the second challenge of Girls Bonus 2, A Trick of the Wind, in which Peach must beat Daisy. In this event, the player shoots five ends each consisting of a single arrow. The player draws the bow by sliding and holding down on the touch screen, and then can aim left and right by sliding on the touch screen, though their arrow will always land at the same height on the boss. Once the player as aimed their shot, they are able to shoot by releasing the stylus from the touch screen. The arrow will score 10 points and land in the target with a sparkle effect if it lands in either of the inner rings of the gold, with each ring outwards after that scoring one fewer point, and none being scored for hitting outside of the target or missing the boss entirely. If the arrow splits a line when it lands, the higher score value is taken. On each end, there is a different pattern of wind across the range, with a single unbroken gust for the first end, a single broken gust for the second, two broken gusts for the third, one unbroken and two broken for the fourth and two unbroken and one broken for the fifth. Each end is timed, with a countdown from ten appearing after a certain amount of time, after which the player's arrow will be automatically shot from wherever they are aiming. Their score is totalled up at the end of each end and a placing is given compared to their opponents. At the end of the five ends, the player is given their total score and their final position in the event. 1) Shoot: Slide ↓ on the Touch Screen and release. 2) Aim: Slide ←/→ while holding down the stylus. This page was last edited on November 29, 2018, at 00:33.